Robert and Sally Day had their special day down the south of the island, location is Pefkos and the venue is The Philosophia restaurant with its stunning views over Pefki beach and the Mediterranean sea. The venue staff are amazing and always ready to serve you food and drink, True Greek hospitality. The bride, Groom and their guests were lovely people, very friendly and welcoming to their family gathering. Enjoying the music I was playing and dancing all night. 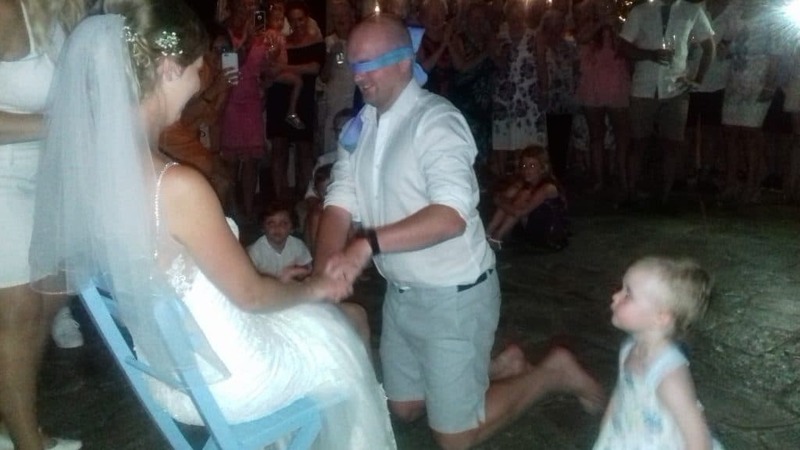 One of the highlights was when the greek dancers placed the shot glass destined for the blindfolded groom between the brides legs under her dress and the best man directed him to it’s location.